Finding your carbon footprint made easy and enjoyable. Greenhouse gases are constantly accumulating in the atmosphere as a result of human activities. Carbon dioxide emissions are occurring in greater amounts than can be absorbed, resulting in excess heat being trapped in the atmosphere. Each person has a carbon footprint, which is the amount of greenhouse gas emissions he or she creates through daily activities like transportation, food choice, and use of energy and electricity in the home. Reducing this footprint is paramount to protecting the environment. However, many current carbon footprint calculators are difficult to use. They are nearly impossible to fill out without extensive records of energy usage in cubic feet and kilowatt-hours, detailed statistics about one’s vehicle, and knowledge of one’s food consumption… in pounds. Also, these “one time” calculators do not give users an incentive to change their footprints – rather, this number is only searched for out of curiosity and then quickly forgotten. With CarbonMe, users fill out a comprehensive form that predicts their carbon footprints using more intuitive information, such as approximate electricity bill cost for the month, type of vehicle and miles driven, and daily number of serving sizes for different food groups. 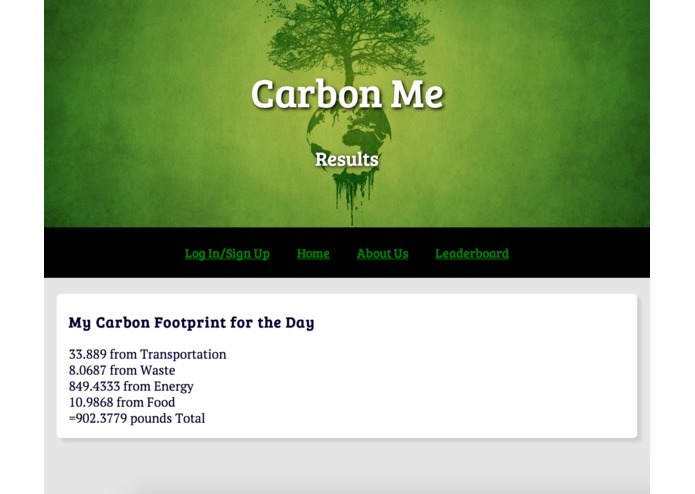 A “daily” carbon footprint score is created, which is saved on a user’s profile. Users can calculate their footprints each day and work to better their scores, and a leaderboard facilitates competition between users to see who can get their carbon footprint the lowest.